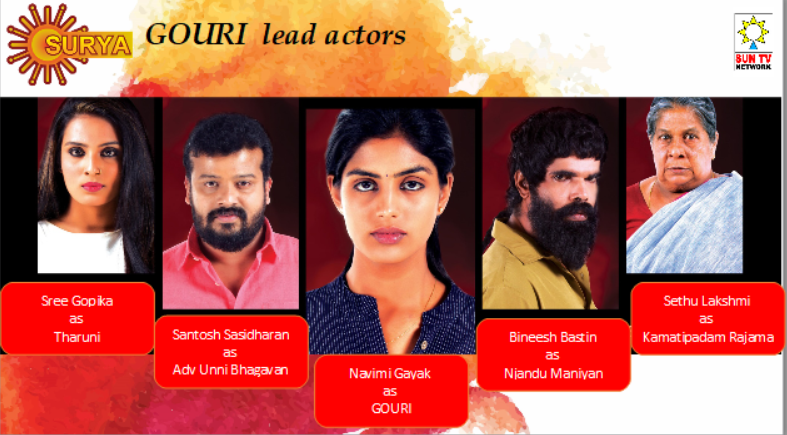 Gouri a girl who flares like an ember, surya tv bringing a latest malayalam serial from next monday onward.GOURI is the eldest daughter of Vasavan and Sujatha who were laborers at an estate in Idukki, a district on the high ranges. Vasavan was crushed to death by an elephant on his way back home after work. This pushed the rest of the family into a state of desolation and dependence. But Gowri was determined to look after her mother and younger sister Tharuni. She started working in the estate and a workshop. She spent rest of her time to continue with education. Anyone anytime could expect the extended hands of Gowri’s help. But fate brought a nemesis into her family in the form of Madathil Iyob Tharakan. Her very sister whom she had protected under her wings was swooped away and destroyed by the vulture, Madathil Iyob Tharakan. She takes revenge on Iyob by Killing Iyob. Gowri leaves Tharuni with her mother and surrenders to the law and she is Jailed. This leads to a new chapter in her life, she leads her life in jail only for the well being of her sister. She helps her sister to continue her education with the meager wages for work done in the jail and also with the kindness of the jail staff.